Wasdale Mountain Rescue Team is a group of dedicated volunteers who turn out at any time of day or night in all weathers throughout the year to search for and rescue lost or injured people from the mountains flanking Wasdale and Eskdale. We welcome applications to become a probationary member of the team from men and women with enthusiasm and commitment to mountain rescue who are willing to respond rapidly to callouts at any time. Applicants should be physically fit, at least competent and experienced fell walkers and preferably skilled mountaineers. They should be familiar with local Wasdale and Eskdale fells in all weather conditions. Unfortunately it is beyond the resources of the team to provide the necessary training for a mountaineering novice to become a probationary member. It is anticipated that applicants will have gained sufficient expertise in general mountaineering techniques elsewhere before applying. To apply to join the team as a probationer please download an application form. Write on the form your history of regular mountain activities at different times of the year, and in particular your recent experience of the Wasdale and Eskdale fells. Please include any experience you may have of rock climbing. Send your completed application form as an attached file in an email to the secretary@ this site or get in touch using the contact form. Subject to a suitable application we will invite you to an interview with a few team members who will ask you some questions about what is written on the form and other questions about your general mountaineering skills. You will also be asked to demonstrate a few practical skills including tying one or two essential knots and a basic demonstration of map and compass navigation. Candidates who have passed the interview are invited to an assessment day. This is a full day out on the Wasdale or Eskdale fells with a team member. 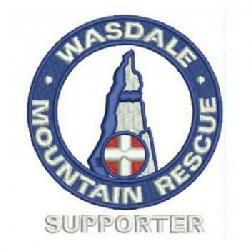 All being well you will then be accepted as a probationary member of Wasdale Mountain Rescue Team. Other than in exceptional circumstances the probationary period for every team member is a minimum of a year to allow a full training round to be completed. You will be asked to come along to a team meeting at our base in Gosforth to meet the team, and an experienced team member who has been assigned as your personal mentor. Over the course of your probationary period you are expected to get to know the local patch in which the team operates very well. You record in your own fell logbook the trips you make out on the Wasdale and Eskdale fells and record all team training you attend. The record of days out on the local fells will reflect an increased local knowledge of the patch. Those trips undertaken with your mentor or other team members demonstrate personal aptitude and attitudes, physical fitness, confidence on steep ground, ability in winter conditions, night and bad weather navigation, and knowledge of your personal skills and limitations. You will also be issued with a training logbook detailing the skills you learn. As you become competent in particular team skills your mentor or other full team member will assess you and sign off the skill area in your training logbook. Most if not all have to be completed before you may be considered for full team membership.